The BlackBerry Q5 is powered by BlackBerry OS 10.1, which we tested on its bigger brother, the Q10. The only noticeable difference is the switch to a light theme (the Q10 used an OLED-friendly dark theme instead). The 10.1 version brings along various optimizations over the initial BB10 release, as well as a bunch of new features - HDR stills, PIN-to-PIN messaging, customizable notifications, click a number to call, Instant Actions in the Universal Search app, etc. We'll cover the whole BlackBerry 10.1 OS ticking inside the Q5 smartphone completely, so don't worry if you still haven't caught up with the Canadians' OS. In terms of inspiration, the new BB OS feels like it has incorporated bits and pieces of WebOS and MeeGo - swipes and backgrounding - but also Android (some contextual menus) and iPhone (the rich elaborate graphics). Only the icon design and some deeper system menus allow but a mere glimpse into the BlackBerry of old. Not that the comfort of loyal users was of utmost importance. You just can't expect to feel right at home in an OS that skips from v7 straight to v10, can you? To unlock the Q5, you can use the Power/Lock button or swipe up from the bottom of the screen (it's important to note that swipes start off the screen). Interestingly, a single swipe will unlock the phone even if the screen is off. It's a unique feature - no need to wake up the device first. It's up to you to decide whether you just want to check out notifications on the lockscreen, without unlocking the phone, or unlock the device and go straight to what you were doing. A short swipe is the Blackberry equivalent of MeeGo's double-tap-to-wake-up. A longer swipe will unlock - and it's not too hard to get the hang of it. The lockscreen itself shows a good deal of info - the time and date, the next event in your calendar, message counters and there's a camera shortcut. A swipe down from the top launches a dim, red clock - great in the dark since it doesn't hurt your eyes with bright light. A tap on the screen brings up the option to set an alarm. The BlackBerry 10 homescreen consists of multiple panes, two of which have a special purpose. The app drawer takes up most of the homescreen panes - it's a paged grid of shortcuts of all installed apps. A long press on an icon starts edit mode, which lets you rearrange icons and uninstall apps with a single tap (deleting obviously works only for non-system apps). By the way, on the homescreen you can initiate a search by just typing something on your keyboard. The search is pretty awesome and will look through your apps, messages, contacts, music, pictures and even offer Extend search, which continues the search in a selected app (e.g. Google Maps, Bing, etc.). Once you have at least one app running, a special pane appears to the left of the app drawer panes. It holds up to eight "active frames" (similar to the WebOS cards), each of which is (typically) a thumbnail of a running app. Not all frames are just a downsized screenshot of the app, some switch to something more informative. For example, the Phone app switches to a list of recent calls, which is big enough to read comfortably. Frames are arranged chronologically and have a small x button when you don't need them any longer. Switching between apps is done with the same swipe up gesture used for unlocking the phone. No matter where you are in the interface, it will bring you to the task switcher page. One thing to note here is that as you swipe up and the current app is pushed into the background, a message counter appear on the left of the screen, showing unread message count for the various messaging services you have setup on the Q5. This is Peek - named that because it lets you check new incoming messages with minimum interruption. If the message doesn't seem important, you can bring your finger back down and you will return to the current app. If just the message source isn't enough to tell whether it is important enough, you can continue swiping to the right. This continuous L-shaped swipe (up, then right) will push the current screen off to the side, revealing BlackBerry Hub. This is BlackBerry 10 new unified inbox, which contains all your messages from all email and social network accounts. Releasing your finger will drop you into the Hub to read the message, or you can just reverse the gesture and go back to working within the current app. The BlackBerry Hub is always the leftmost pane on the homescreen and can be accessed either by the swipe-up-then-right gesture or by tapping the small indicators at the bottom of the screen. Those immediately take you to the respective pane. You can swipe your finger over them to quickly scroll through all homescreen panes if you're not sure where to find the thing you're looking for. We'll get back to Hub in a moment - it's the heart of BlackBerry 10 and perhaps the strongest weapon against competing OSes. There's one more important swipe gesture that will come in use often - a swipe from the top. This has two functions. On the homescreen it brings out a dropdown, hosting all sorts of quick toggles (Settings, Rotation lock, Bluetooth, Wi-Fi, Alarm and Notifications). When you are in an app, it brings out an app-specific list of options (think Menu key in Android). That's a handy way to replace a dedicated Menu button, though things are a bit inconsistent and some apps do have a menu button in the bottom right corner of the screen. Another issue is that quick toggles are only accessible on the homescreen, so you have to exit the current app if you want to switch Wi-Fi on, for example. This defeats the purpose of quick toggles. The BlackBerry 10.1 update allows to customize the notifications for each app - you can set the tone, switch vibration and the LED alerts on/off based on the account. 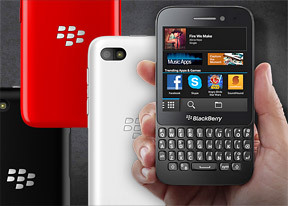 The BlackBerry Q5 packs a Snapdragon 4 chipset with a 1.2GHz dual-core processor and 2GB of RAM. The BB 10 OS has been tailor-made for this hardware (or vice-versa) and everything is fast and fluid. The 3.1" screen is very responsive and doesn't miss taps. Once you get used to all the swipe gestures, BB 10 OS can be fast to operate, but the problem is getting there in the first place. It's a problem we think Windows 8 has too - without an obvious UI element (e.g. a button), a user will have to interact with invisible things that only come to the fore when you do the right gesture. BlackBerry will have a hard task of educating its users about these not-so-obvious gestures. If the swipe down for quick toggles -or- app options (which may be elsewhere) wasn't confusing enough, the Hub makes it even more confusing. But we'll get to that later on in the Messaging section. On the positive side, once we got used to those, the gestures get pretty intuitive. So much so in fact that we found ourselves swiping up on other phones, too. BlackBerry Balance requires BlackBerry Enterprise Services to run, but once enabled it will split the apps on the phone into two - personal and work apps. Files created within work apps are AES256-encrypted and not accessible by personal apps. Switching between work and personal apps is done by swiping down in the app drawer and picking one of the two modes. The separation between work and personal files however means that you might have to download apps twice if you want to use them both for work and play. If you're using your own personal BlackBerry Q5 for work, the IT department can set up what apps will install automatically on the device and what email accounts will be added. They can remotely wipe the work data in Balance too (when you leave the company or lose your phone), but personal data remains intact. Voice commands are all the rage these days, everybody's got them and so does BlackBerry. It's not smart like Google Voice Search or a character like Siri, but the Voice Command app on the BlackBerry Q5 is still fairly usable. You can ask it to call someone, send them an email or text or BBM, schedule an appointment or leave yourself a note. Other options include searching the phone or the Internet and you can update your social networking accounts too - tweet, post a new Facebook status or LinkedIn status. The app cannot answer questions or tell jokes, which are two of the most commonly used extra features of voice assistants. More importantly, it can't change settings (like toggling Wi-Fi on/off) or launch apps (there isn't even any integration with the native BB10 maps application).